Our sleek, sporty NFL LICENSED TEAM LOGO ID Bracelet is 9″ long, and features an enamel hand-painted TEAM LOGO. 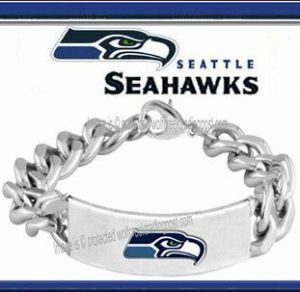 This chrome/base metal bracelet is the perfect gift for yourself or for a loved one. The contemporary, smooth unisex styling is cleverly combined with a comfortable and appealing design to look impressive on both MALE or FEMALE. We will package your bracelet with SPECIAL care and send to you via USPS First Class mail. ALL of our products come to you in NEW AND UNUSED CONDITION. Our Jewelry is the PERFECT GIFT for BIRTHDAYS, HOLIDAYS or ANY OCCASION.